Discussion in 'UFC Discussion' started by Polar Bears, Aug 10, 2015. I was thinking about the number 1 contenders for a title shot and next I wanna see Rosholt vs Stipe for a shot at Werdum, this would be a good fight to determine who gets the next title shot. 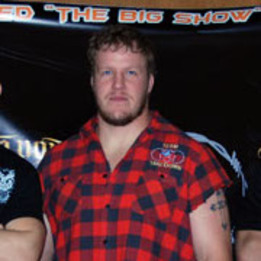 Rosholt would beat Stipe, his wrestling is way too good and top control. Stipe has crisper striking for sure but Rosholt will grab him straight away and make it his fight. Rosholt by decision. It should be Rosholt vs Cain to determine who the true best wrestler is, or Rosholt vs Fedor to see if Fedor is ready for the new breed. Rosholt has some decent wrestling but his cardio and chin are garbage. Any decent striker with good TDD will give him trouble. Stipe would absolutely maul him in the first round by being better everywhere. first is Arlovski vs Mir, then is JDS vs Overeem, then is Stipe vs Cain. Rosholt for a number 1 contender? It should be Rosholt vs someone in Legacy. Guy has no business in the UFC. He should fight for the #1 contender spot in Tachi Palace. While many holes in his game and some of his fights have been hard to watch, Rosholt is still only 29 and 5-1 as a HW in the UFC. Obviously being brought along slowly. I agree that he may not ever have a very high ceiling, though next opponent should still be in the middle tier (winner of Shawn Jordan/Ruslan Magomedov, winner of Anthony Hamilton/Derrick Lewis, potential rematch if Lewis). Rosholt has fans? I thought this was debunked on MonsterQuest. This is a rather poor trolljob IMO. Or TS is Jared Rosholt. Why Rosholt? He hasn't beaten a single ranked HW fighter. Plus, he's only on a 2-fight win-streak. Miocic by whatever he wants. Not to say that I am certain by any stretch that Black Beast gets past Hamilton, but it would be a perfect rematch to avenge a loss, and see if Rosholt has evolved. He was owning Derrick on the ground, and it IMO was a bit of a quick standup. Like Arlovski, IMO their problem is not their chins, it is their defense protecting their chins. His gas tank was disappointing, but who knows, cardio Cain looked far more like classic Tank Abbot in hi last fight, so. . .
IMO, Jared had best work on actively attacking from top control. While Cardio may not be the only way to achieve a level of activity that can avoid being stood up by the referee, it certainly wouldn't hurt his cause. no reason to argue. best ever. He was horrible on that last card and almost got cleaned in the 3rd round by a nobody! He gets destroyed by almost everybody in the top ten.